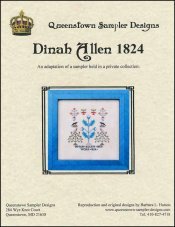 Dinah Allen 1824 [C7292] - $10.00 : Yarn Tree, Your wholesale source for cross stitch supplies. Cross stitch chart from Queenstown Sampler Designs. This design is a charming English miniature sampler from a private collection. The first row has potted berry bushes. Watchful eagles and blue bird - topped fruit trees flank a central teal-leafed sapling. Stitch count 87 tall x 85 wide.